Fall is near in Copenhagen and one of my favorite spots this time of year is the secret library garden. 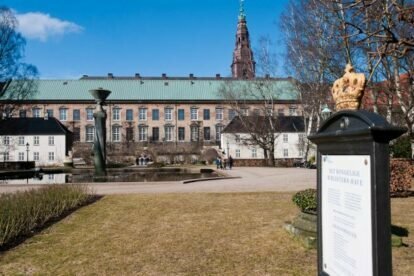 It is wedged between the Christiansborg Parliament building and The Royal Danish Library and is called Bibliotekshaven (literally Library Garden) and is part of the Royal Danish Library. A former shipyard and mooring point for warships during the 17th century, the park is one of the most quiet places in Copenhagen. Hardly anybody in Copenhagen knows of this place, hence it is not nearly as overrun as some of the other Copenhagen parks. The garden is centered around a fountain with a new-ish sculpture in it and there are plenty of benches where one can sit and relax, looking at the statue of Danish philosopher Søren Kierkegaard. The small patches of grass can be used for tanning in the summer or maybe for a picnic basket, but this time of year you are better off sitting on a bench, looking at the leaves returning on the trees and enjoying the silence. You are likely to be there all by yourself. If you look closely you’ll be able to see some of the old mooring rings on the surrounding walls. If the Danish weather behaves badly and the early spring sun is taken over by clouds and rain, the Tøjhusmuseet (The Royal Danish Arsenal Museum) is located next door.